Explains why monuments are important. Look for books about National Monuments & Memorials at Dewey Decimal numbers 973-975 in the Nonfiction section of our library. Use our library catalog to locate your subject. Here are a few titles to get you started. This picture book celebrates and explains America's symbols, landmarks, and important words in lively brief text and bright, humorous illustrations. Symbols are everywhere...but where do they come from? What do they mean? How does something become a symbol? This celebration of twenty of America's important places, interesting objects, and inspiring words is for the youngest Americans. Places in American History introduces young readers to important locations and landmarks in the history of the United States. It explains why the monument is important, and describes what visitors see at the site. Maps, charts, and historic photos help readers understand the significance of this landmark and what makes it so memorable. Use World Book Kids to find out more about your Monument or Memorial. Type the research topic in the box, hit enter. Click the Ben's Guide image below for information about many US Monuments. Click the Washington DC image below for information about many monuments in DC. Use the Next Site button on the right to navigate. 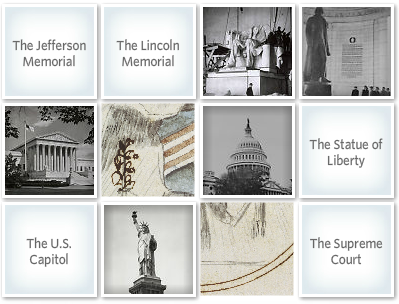 How well do you know the US Monuments? Click the image below to test your knowledge.